Only few destinations allow the visitor to explore lush tropical rain forest, to discover hidden Mayan ruins and to dive in the pristine waters and coral reefs of the second largest barrier reef in the world. Belize is such a destination. Belize, former British Honduras, borders Mexico in the north and Guatemala in the west and south. With its tiny population of around 300.000, less than 5% of the land is inhabited. The culture of Belize is a unique fusion of Creoles (descendants of African slaves), Mestizos, Mayans, East Indians and Europeans. 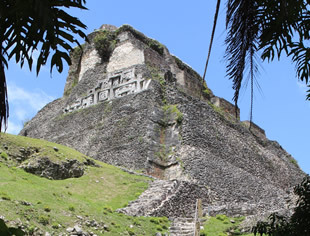 the Mayan ruins of Xunantunich, Cahal Pech and Caracol and the Mountain Pine Ridge Reserve. This small Mayan site is only a short walk from the town of San Ignacio but is well worth exploring. Cahal Pech served as a hill top residence of a Royal Mayan family. Xunantunich, meaning ‘Stone Maiden’, flourished as a ceremonial center during the Classic period. Three plazas, numerous temples and a ball court formed the heart of this city. The spectacular view of the surrounding jungle from the top of the largest structure in the complex, El Castillo 130 ft high, will be the highlight of the visit. The Mayan ruins of Caracol are located deep in the Chiquibul rain forest. Caracol is the largest known and also most spectacular Mayan site in Belize. Founded in 300 BC, its reign continued well into the late Classic Period. At its height Caracol totaled 200.000 inhabitants, almost the same number as Belize today. The site covers 1.5 square miles and includes 5 central plazas, 32 large structures and 12 smaller ones. The Sky Palace (Caana) at 138 ft is the tallest man made structure in Belize. This 800 square kilometer nature reserve, located in the northwestern part of the Maya Mountains, harbors an exceptional ecosystem. Driving through the reserve you will witness first hand how fast the landscape changes from dense jungle into savanna and vice versa. Well worth visiting are the Hidden Valley Falls, over 1000 ft high considered to be the highest waterfall in Central America, and the Rio Frio Cave, used by the Mayans as a ceremonial center. Dozens of small palm tree covered islands, known as cayes, are scattered along the barrier reef in the waters of the coast of Belize. Most cayes are uninhabited, some are privately owned and a few are developed for tourism. Ambergris Caye has the best selection of upscale hotels and resorts and is famous for its high quality dive facilities. Placencia is an idyllically situated Creole fishing village, population of about 600, in the southern part of Belize and has the best white sand beaches on mainland Belize. Placencia offers a wide variety of activities, combining the Caribbean Sea (scuba diving, snorkeling and deep-sea fishing), jungle (Cockscomb Wildlife Sanctuary) and culture (Mayan ruins of Lubantuun) . As a more relaxing alternative, you can lie in a hammock under a palm tree on the beach with or without a cocktail.